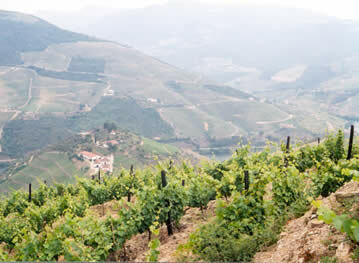 The Douro valley, in northern Portugal, is wine geek heaven. I’ve visited a lot of wine regions, but I was simply stunned by this one. It was my first visit, and although I’ve read a fair bit about the region and seen quite a few pretty pictures, this did little to prepare me for the reality. one of the steep slopes n The scenery is spectacular. As far as the eye can see, the mountainous terrain is covered with countour-line-like terraces. The scale is impressive, too. There’s just so much of it. I don’t think I’m exaggerating too much when I say that the Douro is one of the wonders of the world. Then there’s the soil. The ‘terroir’, if you like that term, is just about perfect for growing quality wine grapes. It’s schist, with a bit of granite here and there. It doesn’t look promising for growing anything, but vines flourish in these conditions. The poor soil encourages them to sink their roots deep, where they find a steady but stingy water supply and divert their energies to grape production. The climate is continental, very hot and desert-dry in the summer; cold and wet in the winter. 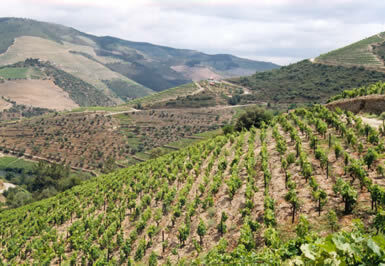 One of the fascinating aspects of the region, though, are the small-scale variations between the different vineyard sites. With each twist and turn of the various valleys, and from the top of the slope to the bottom, conditions can be remarkably different. For example, down by the river the grapes will ripen a lot faster than those at the higher vineyards, which may be 400–500 metres higher up. Looking down over Quinta do Crasto n If the Douro wasn’t already a wine region, no one would think today about putting vineyards here. Far too difficult. I has taken a miracle of agricultural engineering to plant vines here at all. Most of the slopes are so steep that the only way to grow anything is by creating terraces. Terracing the old-fashioned way involved the painstaking construction of dry stone walls to support the banks of soil. Dynamite was (and still is) often needed to clear the way. The modern method is more brute force, with wide terraces being carved out of the hillside by bulldozers. It’s currently boom time in the Douro, so there are lots of bulldozers around. Land prices are currently high. 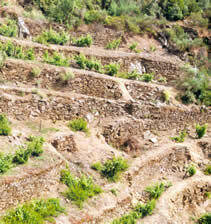 Everywhere you look new vineyards are being planted (at great cost), and old ones renovated. At a certain point in fermentation, while there was still quite a lot of grape sugar left, brandy would be added. This stops the fermentation process leaving a sweet, strong wine that would then be put into cask to begin the ageing process. The major port companies then sent out teams of expert tasters, who would determine the quality and decide the destination of the wines: perhaps LBV, tawny, ruby, or in rare cases in very good vintages, vintage port itself. 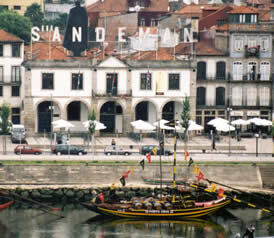 Before the advent of air conditioning, it was then important to transport the wines down river to Porto before the onset of summer, where they were aged in the port lodges of Vila Nova de Gaia. Any wines left in cask over summer in the Douro would be at risk of baking in the heat. It was a fairly perilous journey (these days the Douro is dammed, and is much gentler: gone are the rapids), made then in special boats called ‘rabelos’. Conflicts of interest: in line with good journalistic practice, I need to declare here that my travel and accommodation were paid for by Dirk Niepoort. I'm grateful to Dirk for his generosity, but I have not allowed this to affect my assessments.